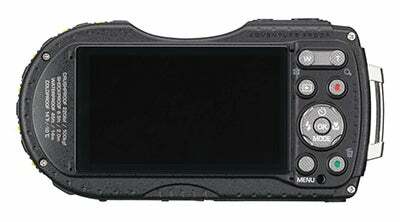 Pentax has refreshed its WG series of compact cameras by launching three new models – the WG-3, WG-3 GPS and WG-10. 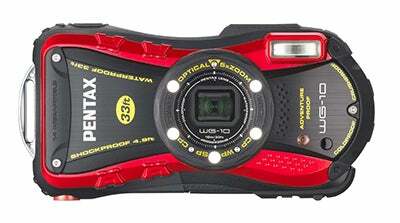 Starting with the Pentax WG-3 and WG-3 GPS, both models have been enhanced so they’re now waterproof down to a depth of 14 meters and shock resistant from a drop height of two meters. Not only are both cameras more rugged than the previous Pentax WG-2, they also feature a newly designed 4x optical zoom lens that offers a 25-100mm zoom coverage and a maximum aperture of f/2. Both the WG-3 and WG-3 GPS are built around a 16MP, back-illuminated CMOS sensor. Coupled with a new-generation imaging engine, the pair deliver a top sensitivity of ISO 6400. To prevent camera shake and subject shake in challenging shooting conditions, the WG-3 and WG-3 GPS also combine an image sensor shift mechanism with a digital shake reduction mode. Another notable feature is the positioning of six LED macro lights around the circumference of the lens to improve macro shooting when the digital microscope mode is selected. With the macro LEDs, the user can clearly see a magnified view of a microscopic subject that’s often unnoticeable with the naked eye, or the cameras LCD. On the subject of the LCD display, both models incorporate a 3in, 460k-dot screen. Full HD movie recording (1920×1080) at a frame rate of 30fps is also available and a micro HDMI terminal is provided to output video content and sound to external devices. The advantage of choosing the WG-3 GPS over the standard WG-3 may seem self explanatory, but as well as supporting a sophisticated GPS function, the WG-3 GPS is compatible with the wireless Qi recharging system. This means you’re not required to physically take the battery out of the camera to charge it. Place the camera on a Qi-compatible wireless recharger and it’ll eliminate the need to ever open and close the battery chamber. 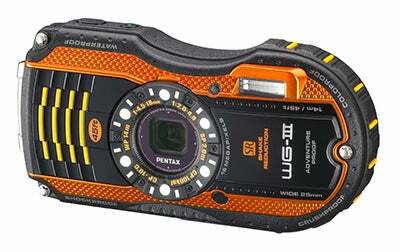 The WG-3 will be available in orange and black from March at a price of £279. Alternatively, if you’d prefer the WG-3 GPS this will be available in purple and green from £329. Alongside the WG-3 and WG-3 GPS models, Pentax has also unveiled the WG-10 – an entry-level model that’s positioned at the entry-level end of the WG series. Designed to make outdoor shooting simple and worry-free, it’s waterproof to a depth of 10 meters and is claimed to operate faultlessly at this depth in continuous operation for up to two hours. As well as this, the WG-10 is shock resistant from a height of 1.5 meters and is also cold resistant against temperatures as low as -10 degrees centigrade. The WG-10 features a 14MP sensor, five light LED macro functionality, 720p HD movie recording and a 2.7in display at the rear. The 5x optical zoom lens has a focal length that’s equivalent to 28-140mm in 35mm terms and there are up to twelve digital filters available for adding creative effects directly to images. 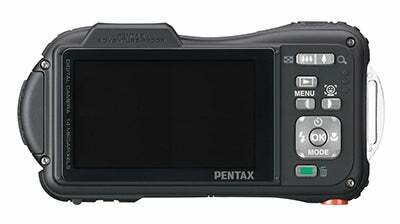 Available in black and red from early March, the Pentax WG-10 is expected to cost £179.